Skybound and Yesterdays is teaming up to bring you Skybound’s first ever pin set. Each pin features iconic art from comics like The Walking Dead, Invincible and Saga. There are 7 pins available at the main Skybound booth (#2729), featuring beautiful enamel artwork from Skybound titles The Walking Dead, Manifest Destiny, and Invincible. Each pin is limited to 1000 pieces and are $10 each. At the Saga Shop booth (#2629B), there will also be a Ghus pin and a special 2-pin set celebrating the galaxy’s favorite feline, Lying Cat, along with her favorite catchphrase “Lying.” Both Ghus and the Lying Cat 2 pin set are limited to 1000 pieces, Ghus is $10 and the set is $15. Yesterdays is a collectible enamel pin company run by 3 friends out of Southern California. With a focus on art, pop culture and humor, they've created over 150 different styles made in collaboration with their friends and most beloved artists. From creators like Skinner and Alex Pardee to indie comics legend Mike Allred, they've created some amazing pins. 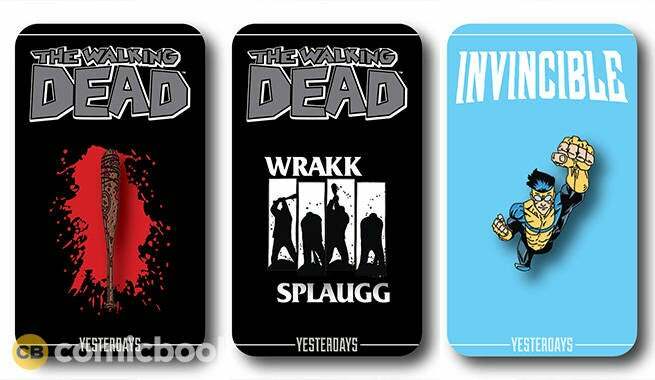 Their latest partnership with Skybound will bring the incredible works of Saga, Invincible, Manifest Destiny and The Walking Dead directly to the pin game. The pin game is strong with them. San Diego Comic Con will take over southern California July 21 through July 24 this summer.